World Net Daily and Yahoo Associated Content report that a former 2008 Hawaii election clerk, Tim Adams, has sworn that his supervisors told him that no long-form, hospital-generated birth certificate exists in Hawaii. He's not the only one. According to Examiner, Newser, The Daily Caller, and Fox News blogs, celebrity journalist Mike Evans, apparently a friend of Hawaii governor Neil Abercrombie, shared a story with a radio station. He told them that the governor has privately told him that no certificate exists - there is no proof in Hawaii that Barack Obama was born there. I am not foolish enough to think that I possess a proof in one way or another but I do think that it is more likely that Barack Obama wasn't born in Hawaii so please feel free to count me as a softcore birther. I know something about the administrative obstacles that women who want to marry African men have to face and the amount of paperwork tricks that they're ready to go through - especially if they love the man. Improving the place of the birth of their kid is the smallest part of what they're ready to undergo. Such things are happening all the time. Given the fact that the birth certificate could have been produced but wasn't produced, there are very good reasons to think that Obama's birth was one of those cases (or that he is hiding something even more important). Some people suggest that Obama's possible birth in Africa is a big conspiracy theory because we're talking about the president of the United States who surely has no ghosts of this caliber, right? However, this argument is acausal and therefore completely illogical. The fact that someone is the president of a wealthy country may only affect the precision of acts he does when he is the president - the fact may only affect the future - but it cannot change the past. You know, the logical arrow of time is omnipresent and insurmountable even though many people have problems to understand this part of science and common sense. The "improvement of the birth place" could easily take place, like in many other families, and because no one has seriously asked Obama to prove that this hypothesis is invalid so far, the fact that he became the U.S. president changes nothing about the likelihood of the possibility whatsoever. 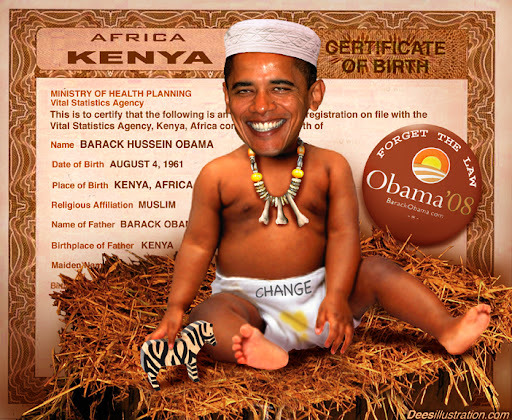 I know that some birthers are really obsessed with their fake certainty that Obama was born in Kenya; some of them could be classified as cranks and fanatical partisans. However, it's equally true that most of the attacks against the birthers are just illogical ad hominem rubbish and intimidation. The very name "birther" was chosen to be similar to "truthers", the kooks who think that 9/11 was an inside job. Next year, those uncertainties could become irrelevant because Arizona is pretty likely to pass a bill requiring presidential candidates to prove their eligibility which is - given the now well-known de facto impossibility to produce the certificate - something that Obama will be unable to do. So he is likely to be a one-term president. Unless he decides to visit Starship Enterprise where the certificate is located according Leonard McCoy. or any other words about this propaganda that was contaminating the U.S. politics for many years - except for oil that he wants to partly replace by biofuels in one sentence. Thank God, the top progressive U.S. politician has mostly left the climate fearmongering bandwagon but it may take a very long time before Barack Obama's newly acquired decency surrounding the hype trickles down and the stinking climate change rats are chased out of the universities and similar places.